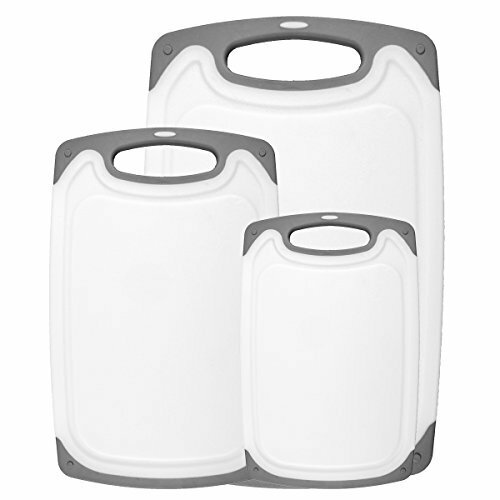 Keep your counters safe while preparing meals with this 3-piece versatile cutting board set designed to make meal prep easier, cleaner and more efficient. When it's time to chop up vegetables for dinner or prepare chicken for your meal prep plan, you don't want to leave deep cuts in your counter and you don't want to bacteria sticking to your wooden or bamboo cutting surface. That's why we created HOMWE Cutting Boards, a heavy-duty, BPA-free plastic cutting board set that gives you more cutting versatility and efficiency that's cleaner, safer and better for daily food prep. Boasting a juice groove to catch sticky liquids and a non-slip handle to keep it in place, each board is designed for creating healthier meals more easily. Click 'Add to Cart' above to get a better, more food and kitchen friendly cutting board for your home and your meals. Precision Cutting Surface - Crafted with a thick, heavy-duty plastic, our BPA-free cutting boards provide a hypoallergenic food prep surface for every meal. Multiple Prep Board Pack - Each order comes with three distinct cutting board sizes, including small, medium and large; perfect for multi-course meals or all-day use. Juice Grooves & Handles - These reversible cutting boards feature juice grooves to catch sticky or acidic drippings and non-slip handles to protect you and surfaces. Safe, Durable & Easy to Clean - A non-porous, ultra-strong cutting surface is gentle on cutlery and knives and can be put in the dishwasher for quick, easy cleanup. Chop, Scrape & Dice - Tough enough to withstand heavy chopping, slicing, dicing and sharp knives, our surface won't retain bacteria, stains or odors for long-term use. If you have any questions about this product by HOMWE, contact us by completing and submitting the form below. If you are looking for a specif part number, please include it with your message.